Many people believe in that statement and follow a path in life that subscribes to that way of thinking. To a certain extent, it worked for Scott Pauley and me during our recent visit to the “Show Me” State in and around Lake of the Ozarks, Missouri. Pauley, who is contracted out by the state’s Division of Tourism for promoting its fishing resources (hint, hint I Love NY people), visited Niagara USA a few years ago on his way back from attending the Outdoor Writers Association of America conference in Lake Placid. He enjoyed a couple of days of fishing, including some pretty darn good bass action on the Niagara Bar, during his September stop-over. He offered to take us out with the hopes of showing off his home state. More on that a little later. We ended Part II by checking in to Holiday Shores Resort (www.holidayshoresresort.com), located between Osage Beach and Lake Ozark. 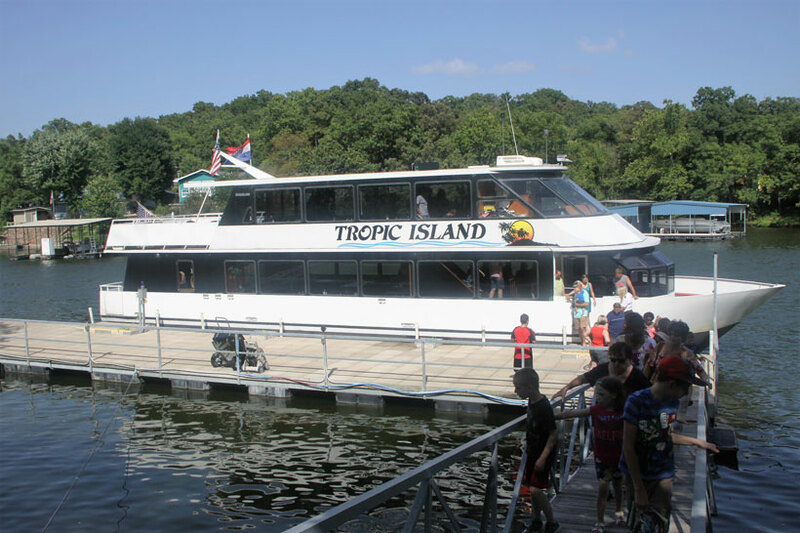 We unpacked the Tahoe and headed over to the Tropic Island, a 75-foot luxury yacht that offers 90-minute narrated cruises around the lake at a nominal fee. Captain Omer Clark runs a tight ship and the trip was very informative (www.tropicislandcruises.com). Back to our temporary home at Holiday Shores. What was cool about this place was that we had our choice of three different floors for sleeping options. We were up bright and early to meet up with Marjorie Beenders and Kyle Stewart for breakfast (at Stewart’s, of course, for another cinnamon roll and a pork chop breakfast) for a recap of what we had experienced so far and plans for what was yet to come . Of course, they were happy the trip was going well, but it’s what they expected. They had much pride in the area, as well as the state. They couldn’t wait to “show me” more. Off to Lake of the Ozarks State Park (www.mostateparks.com), the state’s flag ship park at nearly 18,000 acres. Not only is it the biggest, it is also the most popular as far as visitation is concerned. I’m still amazed that there is no fee to enter any of the state parks in Missouri. A total of 12 hiking trails are available. That’s not all though. The park offers up a self-guided aquatic trail, mountain biking options and equestrian trails for those that like to ride horses. The park also has boat rentals, public ramps and docks. Fishing is always just a cast away. Inside the park was another attraction we needed to see: Ozark Caverns. This one was entirely different than the Bridal Cave. There was no internal lighting (we had to carry lanterns on the tour) and we couldn’t take anything extra into the caverns (like wallets or cameras) due to the threat of White-Nose Syndrome (WNS) spores being carried out and transported to another area. WNS is decimating bat populations throughout the continent. Since it was first discovered in Howes Cave in New York in 2006, more than a million bats have already died. It’s important to become informed on the issues. The tour itself was very interesting, featuring an impressive “angel shower” – one of only 14 in the world and the only one in the United States open to the public. The “angel shower” pours a never-ending stream of water out of appears to be solid rock and into a bath tub made of calcite. The source of the water, despite some intensive research, has not been discovered. For more information on the caverns, call 573-346-2500. After we left the caverns, we took a quick tour around the park and visited the Swinging Bridges of Brumley – a historical attraction off the beaten path. We actually caught some of the locals doing some “bridge jumping” (not recommended) as we drove across the 400 foot long antiquated structure. 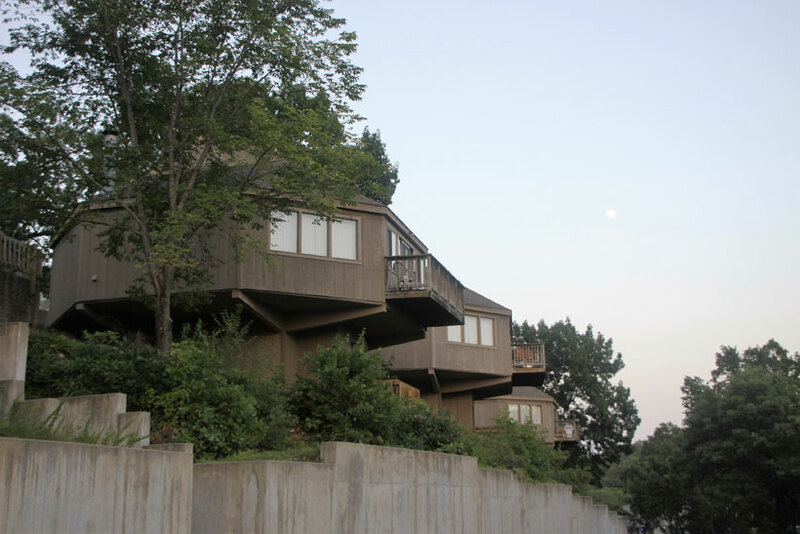 It has stood the test of time, an early adaptation to the construction of Lake of the Ozarks back in 1931. Not knowing how far we were from any kind of a gas station (and with our gas gauge flashing an early warning) we used Onstar to locate the nearest petrol store to avert any kind of embarrassment. Technology can be wonderful. Onstar sent the Tahoe directions immediately to the navigation system and we were filling up within five minutes. We were closer to civilization than we thought. Tip: check the gas tank! We hit a couple of wineries during our stay, finding many of the selections to our liking. Shawnee Bluff Winery (www.shawneebluffwinery.com) in Lake Ozark offered a great view overlooking the lake with an indoor tasting room and bistro that was pleasing to the palate. There were several other wineries in the area, too – a great way to break up the trip. While golfing didn’t fit into our itinerary this time around, the area offered up some amazing courses. If you enjoy hitting the little white ball around, you’ll want to check out this region for sure. The only golfing we did was at Sugar Creek for a quick round of miniature golf. Even those courses are elaborate, giving us the option of two different 18-hole courses. (www.sugarcreekminigolf.com). As we’ve been saying all along, fun for the whole family! Another side trip was to Tour L’Osage Caviar facilities, a subsidiary to Osage Catfisheries, Inc. Founded by Jim Kahrs in 1953, the caviar side of things blossomed because of the declining wild sturgeon populations in the Caspian Sea. 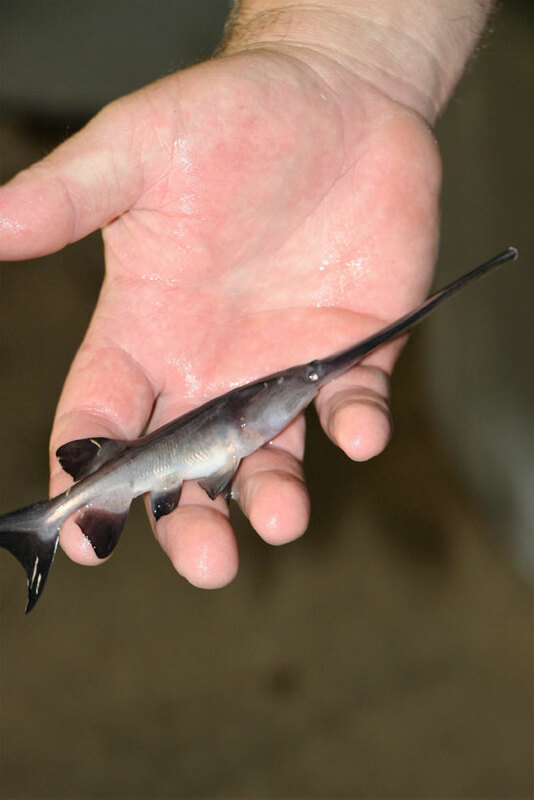 In 1981, the family began paddlefish production – a fish found abundantly in the lake – and started its “paddlefish ranching program” in 1984. The icing on the cake, so to speak, was the final fishing trip courtesy of Pauley. Big Ed Franko, Lake of the Ozarks fishing guide (www.bigedsguideservice.com) and co-owner of Bass & Baskets Bed and Breakfast in Lake Ozark (www.bassandbaskets.com) with his wife, Deb, also offered to help take our little group out in the morning before the sun chased us indoors. It was going to be a hot one! We met at Big Ed’s lakefront accommodation and boat dock. Pauley was already there. We hopped on board and within five minutes we were fishing. Laurie Calvert from Oregon City, Oregon, was the first to create excitement with hauling in a four and a half pound largemouth – her first fish ever! She was bouncing a rubber worm along the bottom. Her husband, Joe, will now have to include her on future fishing outings!! Everyone caught fish for the few hours we were on the water. Crankbaits, swim baits and rubber worms were the three most popular enticements. It was near the end of our trip when my rod doubled over while drifting a rubber worm in 25 feet of water. Several times the fish stripped out line. 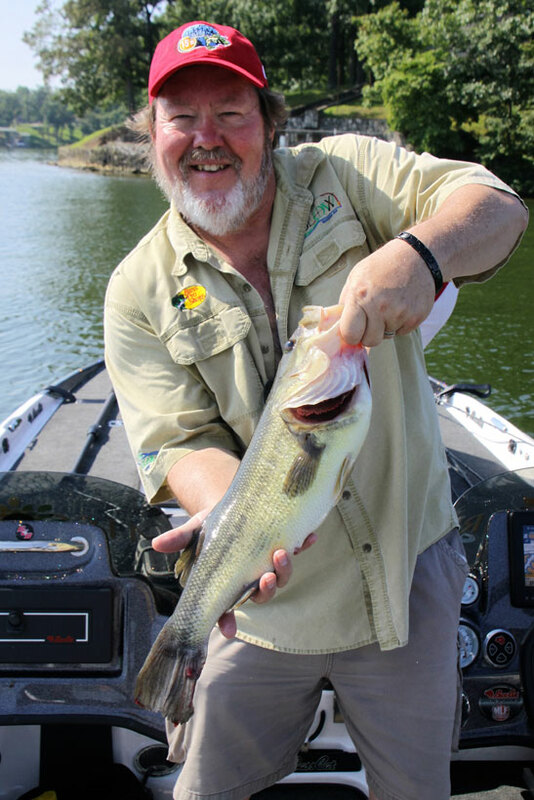 Finally, after about a five minute battle, we pulled in a hefty six pound largemouth – a personal best. What a great way to end our trip, after exploring a new area and making new friends along the way. That’s what it’s all about. 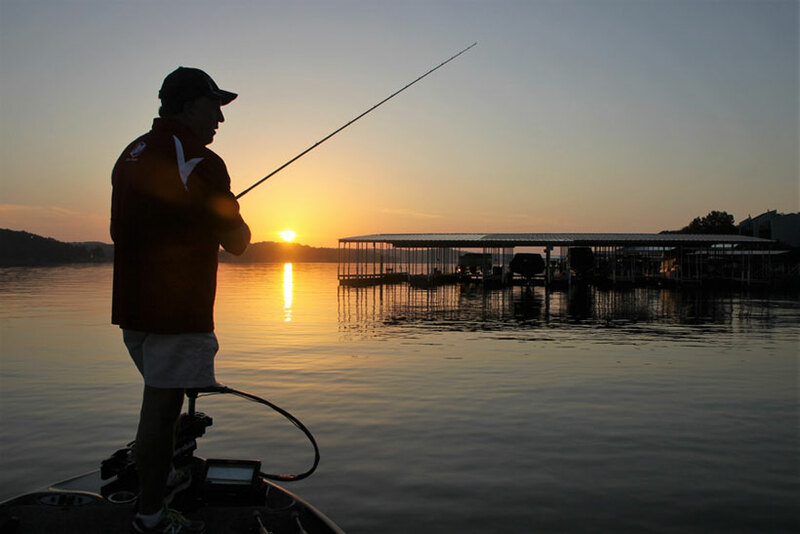 We can cross the Ozarks off of our bucket list, but that doesn’t mean we won’t be back for some more fun in the sun and on the water. Be sure to check out the Ozarks Convention and Visitor Bureau’s website at www.FunLake.com; 1-800-FUN-LAKE.